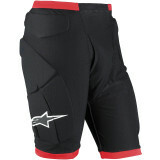 Tight tee - Colorado Sizing chart "I love Alpinestars! They need to update their sizing chart accordingly. These shorts are too small, my gloves are too small as well. Get the next size up from the chart." Ronnie117 - Baton Rouge La Excellent purchase!!!!! "I’ve always relied on the thin hip pads that come with MX pants, thinking that the shorts would be uncomfortable and hot. If you have this mentality, you are wrong. Much more protection, much more comfortable than hip pads, no restrictions, fits right over my knee braces, and breathable. 2nd ride in and I ordered a second pair. All around, a great product, and I won’t ride with out them."